Produktinformationen "Kustoms Illustrated Issue #52"
We have massive show coverage in this issue that spans the East Coast, Mid-West and West Coast! First up, the Custom Car Revival in Indy, Gambino’s “Sit Down” in California, and exclusive coverage of the Jalopyrama “Customs at the Shipley” in Maryland. 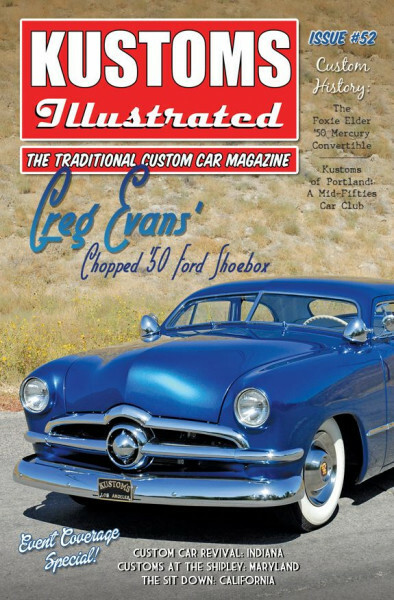 Our cover car is Greg Evan’s beautiful chopped ’50 Ford shoebox that has been under the torch at King Kustoms in Temecula for the last couple years. We have the exclusive on the fantastic looking kustom! This issue is also loaded with custom car history including a two part article written by noted author, Albert Drake on a mid-‘50s custom car club known as Kustoms of Portland. Also, we have never before seen vintage photos of the “Foxie” Elder ’50 Mercury convertible. You don’t want to miss this issue! Weiterführende Links zu "Kustoms Illustrated Issue #52"
Kundenbewertungen für "Kustoms Illustrated Issue #52"